I was suspicious of this book. Because as much as I respect advertising, I don’t believe that it can really “shake the world”. Thus the title felt, at best, like a too-clever-by-half reference to John Reed’s “Ten Days That Shook the World”, and at worst like the kind of self-aggrandizing yet deeply cynical exercise that are long on fluff, short on insight, and way too prevalent in our industry. If you’re in the advertising business, you should pick up “20 Ads…”. If you’ve ever seen an advertisement, you should pick up “20 Ads…”. And if you’ve lived in America at any point during the past hundred years, you should pick up “20 Ads…”. Or said another way, you really should consider picking up “20 Ads…”. Now, it would be easy in a book like this to hammer the idea that advertising leads culture. That us clever agency folks live on the bleeding edge of the zeitgeist – and that we parse out that wisdom to the masses from our Madison Avenue Mountaintops. But, Twitchell says no. Advertising does not lead the public by the nose down the path of sin and degradation. Actually, advertising is more of a mirror of that sin and degradation – indeed a brighter, more glaring mirror than any of us want to recognize (this idea is also developed in Stephen Fox’s excellent “The Mirror Makers”, which we reviewed here). Look through these ads and you will see a much more accurate representation of our biases, our bigotries, our hopes and our dreams than anywhere else. And they are crasser here – our anxieties (like say, Listerine’s “If you Want the Truth…” ads in Chapter 5) are more blatantly displayed here than any movie or song would dare. What we really think of women and minorities and our bodies and ourselves is revealed in advertising in all its ugly splendor. Why? A couple of reasons. First, advertising is fast. It generally doesn’t have the time to be sweetened. As a result, it’s a better snapshot because it’s more immediate. And it has to be more immediate, because companies need sales NOW. Sure, sales tomorrow are good, but not at the expense of making the numbers right now. Combine that with CMOs and brand managers holding their jobs for shorter and shorter intervals, and you get a process that functions in lifespans that are short even by a fly’s standards. Second, advertising hasn’t been produced with an eye to posterity until quite recently (and “20 Ads…”, it must be admitted, stops in the 80s). So not only was it hamstrung by short timelines, it also had (and probably by and large still does have) the luxury of knowing that no one will ever see these things six months or a year from now. Movies, books, music – they’ve always been produced knowing that even if they were ignored today a generation unborn might still be their audience. But how many of your campaigns are still knocking around? Hell, how many of them can you even remember? Twitchell’s book explores all of this – and more – in a style that is friendly while informative. He recognizes that most of his readers will be unfamiliar with the details of the work he’s showing them, yet he dives just deep enough into their backstories to illuminate the ads without blinding the reader. That’s no mean feat, and while it may not seem earth-shaking, it’s rare enough to make “20 Ads…” a must-read for anyone interested in creating the next 20 ads that will shake the world. 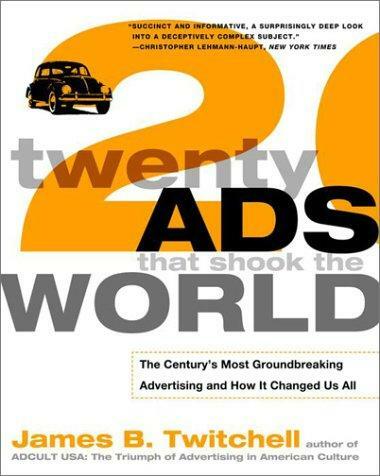 Twenty Ads That Shook the World by James B. Twitchell was published by Three Rivers Press on 12/26/01 – order it from Amazon here or from Barnes & Noble here – or pick it up at your local bookseller ( find one here).